Market Timing - Is this right time to enter/exit market ? Funds Ranking - Identify who are the top 3 runners ! Step 1 - Is this the right time to enter/exit market ? How to know if I should be in the market or on the sidelines? As mentioned earlier we will use BPNYA indicator to tell us probable market direction and danger zones. Is there a entry/exit signal !!! We consider a entry/exit based on every time BPNYA Index crosses EMA(30), let's take a look at this example. Our point of interest is in the junction when BPNYA Index crosses EMA(30), depending on the condition - if the crossing happened while BPNYA moving upward or downward we determine if its time to get in the market or get out of the market. We also consider EMA(30) position relative to SMA(50) (line in blue) & SMA(200) (line in red) to guide us if market is acting bit trickier. Click here to see FULL size Chart. 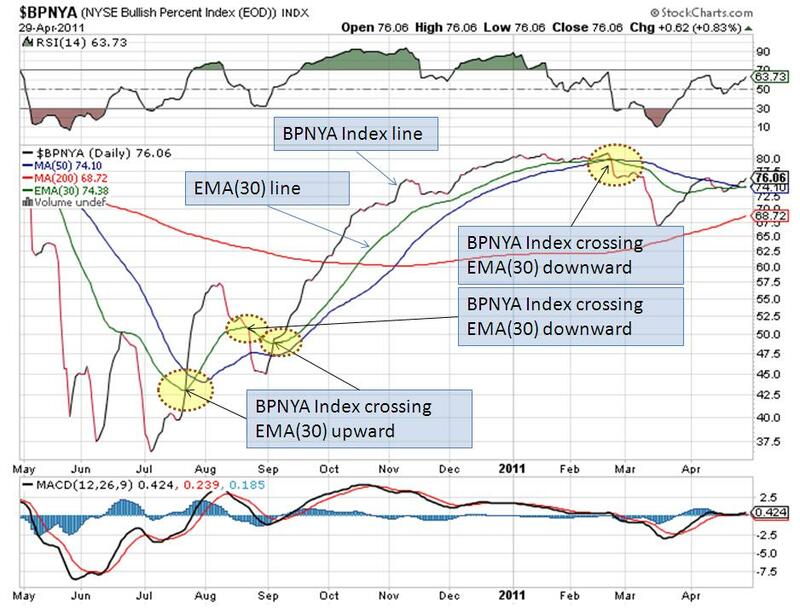 Where can I get BPNYA Index chart? Not to worry, the information provided above is just for your basic understanding. We are not deriving market timing from any proprietary indicator but general public information available to all. The GOOD NEWS is that we have developed a tool for you which will provide you entry and exit signals based on your input, SOUNDS EASY!!! If you are not sure how to read the chart, you can choose to follow our BLOG where we summarize market conditions once every week. Step 2 - How to find which are the TOP 3 Funds in the ranking ? Use the spreadsheet (from download section in next part) and follow the directions. The spreadsheet will calculate ranking for all the selected funds which in turn will provide you with 3 TOP ranked Funds based on your selection. Exclude target date funds or bond funds from your 401K, 529 Plan or HSA choices & enter rest of Mutual Fund Symbols (available to you from your employer,broker,etc) in the spreadsheet. If you have Traditional IRA & Roth IRA with any brokerage firm then typically you have plenty of investment options such as Mutual Funds, ETFs, Stocks, etc. You can use this techniques for Mutual Funds & ETFs. However, do not mix Mutual Funds with ETFs in the same spreadsheet as it may give mixed results. You can download the spreadsheet for Mutual Funds and ETFs separately, however the logic remains same. You can enter 401K Mutual Funds for your entire family in same spreadsheet and use Tag column to sort them accordingly. You can find more information on how to setup spreadsheet here. Step 3 - When to re-allocate my portfolio ? Move your money from Money Market Fund to any/all TOP 3 ranked Funds so that your money grows and you do not miss out the market rally. to either retain the Fund or move money from that fund to any TOP 3 ranked Funds at that point in time. down losses. If the SELL signal is triggered then close the position in that Fund and chose another best runner from Top 3. Why should I monitor? I mean can't I allocate my portfolio to TOP 3 ranked Funds and forget!!! Think of last time you forgot your portfolio allocation and what happened in 2008 financial crisis! Many people lost almost 30-50% of their retirement savings. Lets go back to our example: In a Derby (horse race), does same horse win the race every time? We don't think so... Similarly, today's financial markets are very dynamic and global. If you want to secure your financial future then take control of your portfolio and finances. The fact is you need to guard your money and not rely on news channels/financial advisers/TV programs/others/etc. Depending on your comfort level you can decide your monitoring interval. Considering today's Financial Markets and Global influences, we would monitor at least every week or two. Remember, monitoring does not mean you re-allocate your portfolio every week, all it means is if you sense any danger then protect your money or else let it ride the wave. Typically, before any major crash or crisis, markets give enough warning signs of danger zone which are clues for us to avoid danger.